As market participants face complex new rules for energy and commodity trading, regulatory compliance becomes a rising part of the cost of doing business. Many trading operations are being forced to reinvent their technology, their workflows and even their portfolio choices. 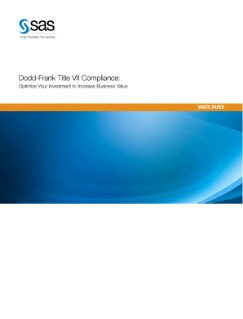 Instead of viewing the new regulatory requirements as an admission fee or fax, firms can take advantage of the business improvements driven by the Dodd-Frank compliance investments to bring added efficiency and risk control to their trading operations.